There’s no question that data is growing at an unprecedented rate across the digital universe, both in terms of volume and variety. All of this colossal amount of data that enterprises generate comprises historical data, real-time data, market research data, competitor data, and various other data sources. Businesses collect data from multiple systems – internal LOB systems such as ERP, CRM, HR, Business Intelligence (BI) systems, as well as external sources such as market research, syndicated data, social feeds, and so on. All of this data is available in a raw, unstructured format, which requires processing and analysis to deliver value to businesses. All of this data holds tremendous potential to provide organizations with valuable insights that can affect business outcomes. All over the world, organizations are evaluating and investing in analytic tools to collect and analyze the data, to extract meaningful insights. However, this a very simplified way to look at it. When leveraging big data and data analytics, there is the challenge of sharing the results derived from this analysis in a format that everyone is able to understand and utilize. The biggest challenge decision makers face is that they don’t have a comprehensive view of how well systems are performing in order to make intelligent, well-informed decisions. They are forced to switch across multiple spreadsheets, never-ending reports, applications, systems, dashboards, etc. and then finally make decisions and establish strategies, based on the limited intelligence they have gathered from their research. Despite this process being tedious and cumbersome, it still does not deliver relevant insights that can be used in current workflows and subsequently, does not deliver the results businesses are looking for. You’re investing immense time, effort and resources into capturing data from a variety of sources, which includes hefty investments in data brokers such as Nielsen. However, this unstructured data does not serve any purpose, unless it is made actionable. This is where artificial intelligence (AI) plays a key role. What it does is transform data into insights that are easy to understand and consume, and it does so at scale. 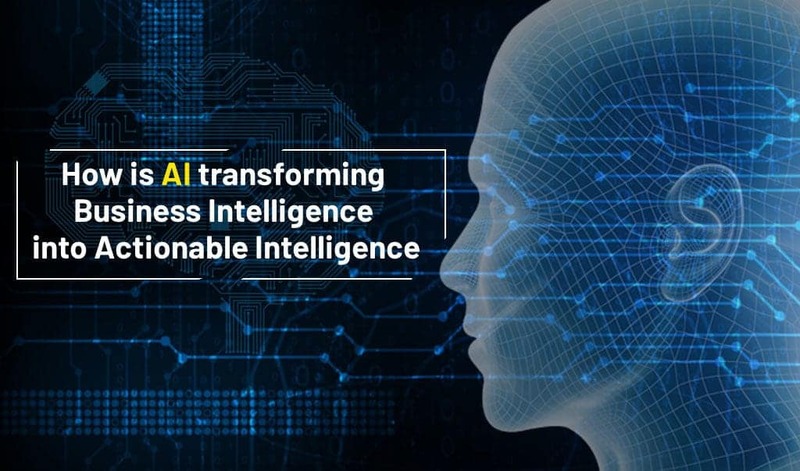 How AI Transforms BI into Actionable Intelligence? Every organization, no matter how big or small, generates colossal amounts of data every single minute. Expecting to find any relevant insights across these buckets of raw data is akin to looking for a needle in a haystack. Businesses collect data from a variety of sources – internal LOB systems, competitors, market research and multiple digital media. AI technologies such as machine Learning enables you to convert this raw data into insights that improve business results. While data discovery is critical to making key business decisions, it is impractical and extremely time-consuming for decision makers to sift through multiple sheets, reports, dashboards, etc. to identify trends and make well-informed decisions. AI systems like machine learning and predictive analytics do all of the hard work of identifying anomalies and establishing patterns in data and alerts decisions makers of these observations, so they are better equipped to make decisions. What decision makers really love about leveraging the power of AI chatbots is its ease of use. 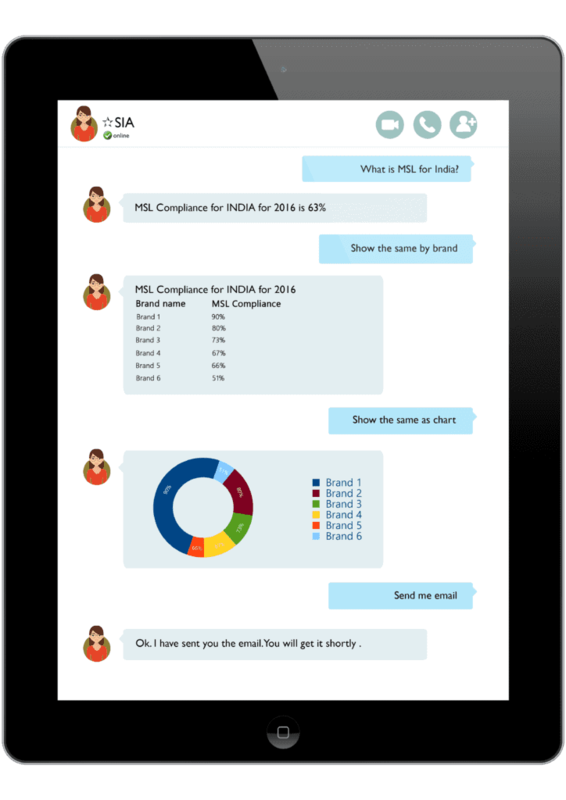 Business Intelligence chatbots provide them with deep insights and metrics at the most granular level, but with the ease of simply having a conversation with a person. They can use their favorite messaging application to chat with the bot and get the information they require. Bots humanize the BI system and eliminate the inconvenience of having to switch between multiple platforms, tools, dashboards etc. and manually filtering data, in order to arrive at important decisions and is a godsend for employees on the field (ex: field sales personnel) as they need to swiftly access information to make decisions without having to drill through a lot of information. 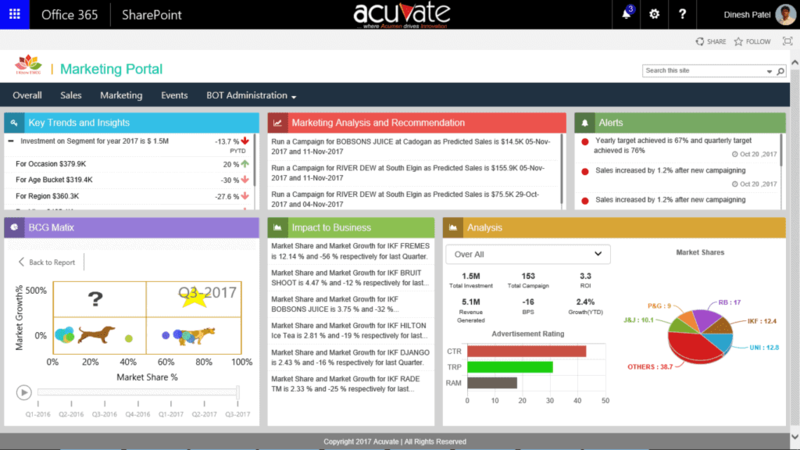 At Acuvate, we’ve been working closely with Fortune CPG companies like Unilever, Britvic, Reckitt Benckiser to provide them with AI-Powered Business Intelligence solutions for Consumer Goods companies. Our goal is to help these companies make data work for them and leverage it to generate increased revenue. By using AI-Powered analytics like predictive and prescriptive analytics and chatbots, we’ve helped virtually all these companies increase market share by over 2%. 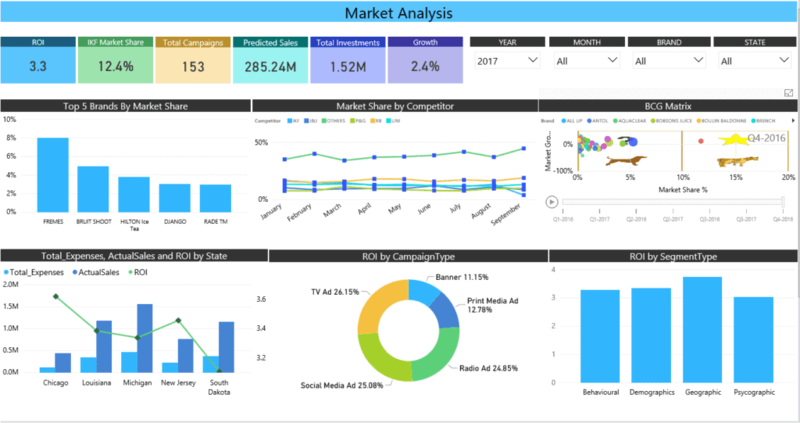 Below are some dashboard images of an AI-Powered Business Intelligence for CPG and Food and Beverage Companies. 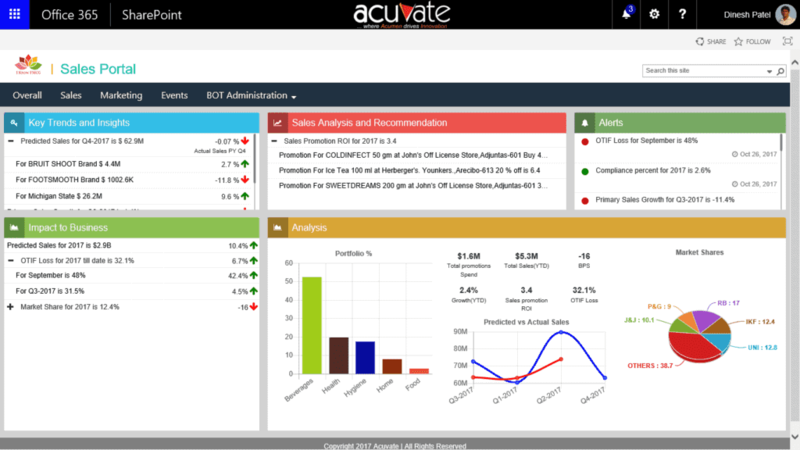 Hemanth is a Practice Head (Analytics & Data Business) at Acuvate Software. He was previously heading the Innovation lab & Tech readiness department at Acuvate. His current role demands providing Delivery Oversight, ensuring team’s readiness and managing the service portfolio of Analytics and Database Practice. Hemanth has consulted various Manufacturing, Consumer Goods and BFSI clients on large scale Data related initiatives. Hemanth has been a part of Acuvate for more than 5 years.